The result of this council was the Nicene Creed, which declared, among other things, that Jesus was “very God of very God, begotten, not made.” This meant that Arius – the Egyptian cleric whose controversial teachings had elicited the council – was wrong in his insistence that there was a time when the Logos did not exist. Something else was also addressed at the Council of Nicea. It was not the New Testament canon, contrary to the fictitious gobbledegook that has been spread by The Da Vinci Code and similar books. It was the date of Easter. Some Christians had a special annual celebration of the Lord’s resurrection on the same day as the Jewish Passover. Others, though, celebrated Holy Week annually with the Lord’s resurrection always observed on a Sunday. This difference had persisted for a long time – ever since the days of the students of the apostles. In Ignatius’ closing comments in his Letter to the Philippians, he stated that whoever observes the Passover with the Jews or receives the emblems of their feast is a partaker with those who killed the Lord and His apostles - quite a heavy denunciation, though it is unclear if Ignatius was referring to merely celebrating the Lord’s resurrection at the same time the Jews celebrated Passover, or to participating in the Judaic Passover observance itself. 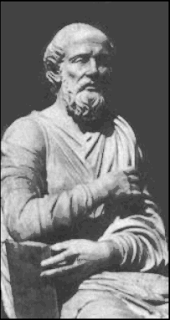 Hippolytus, in Book 8 of his lengthy composition Refutation of All Heresies, firmly opposed those who celebrated Easter on the 14th of the month; yet even though he called them heretics, he acknowledged that in other regards they kept the apostolic faith and traditions. Eusebius of Caesarea (a participant in the Council of Nicea who tended to sympathize with Arius, but not too vocally) described the controversy that arose in the 100’s, in his Ecclesiastical History, Book 5, chapters 24-25. Congregations in Asia (i.e., western Turkey), Eusebius reported, customarily observed a tradition that the resurrection of Christ corresponded annually with the Jewish Passover (the 14th day of the month Nisan), whether it was a Sunday or not. But in other places, including Jerusalem and Rome, it was customary to always celebrate the resurrection of Christ on a Sunday – and the leaders of those places wrote to the churches in Asia, appealing to them to alter their custom. Polycrates, a leader in the Asian churches, responded with a letter – Eusebius cited it specifically and presented its contents – in which he stated that Philip the evangelist, John the apostle, Polycarp the martyr, Melito of Sardis, and others (including relatives of Polycrates) had all observed the resurrection of Christ on the 14th of the month – and he had no intention of deviating from that tradition. In 193, Victor, bishop of Rome, initially resolved to excommunicate Polycrates and everyone who agreed with him. This course of action was averted, though, by advice given by several other bishops – one of whom was none other than the renowned Irenaeus of Lyons. And there is more. In the composition by Irenaeus presented by Eusebius, Irenaeus mentions that Polycarp, when he was at Rome, disagreed with Anicetus (apparently about when to celebrate Easter), and neither could persuade the other – so they agreed to disagree. The agreement to disagree effectively ended, though, at Nicea. The Quartodecimanians – those who observed Easter on the 14th of the month – were summarily denounced. 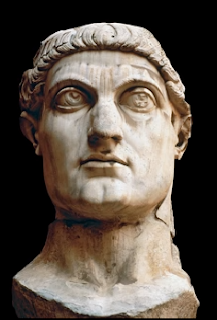 The exact wording of the decree at Nicea about this is unknown, but in 341 at the the Council of Antioch, a decree was issued which, in the course of affirming the Council of Nicea, stated that bishops who observed the Lord’s resurrection at the same time as the Jews (that is, on the 14th of Nisan) were to be relieved of duty. The thing to see is that an annual cycle of Easter-observance emerged very early, and became entrenched very quickly, in the first half of the 100s. It seems very likely that other annual observances spread at the same time and that this elicited the early emergence of lection-cycles. In the case of the annual feast of Pentecost, Christian observance of Pentecost is mentioned not only in the New Testament book of Acts, but also in the anonymous second-century composition Epistula Apostolorum (which also mentions the Easter celebration). The early establishment of annual Christian festivals provided a setting in which it was almost inevitable that specific passages were assigned to be read on specific days. This established the basic building-blocks of what eventually became annual cycles of lectionary-readings – reading-cycles that were initially independent and localized (like the manner in which Easter was observed), but which gradually became more uniform. ● Matthew 8:13. A small assortment of manuscripts has an extra sentence attached to this verse: “And the centurion returned to his house, and in that hour the servant was made whole.” If these manuscripts were all medieval, this reading would likely be dismissed as a harmonization to the parallel in Luke 7:10, intended to round off a lection. And, indeed, this verse concludes the lection for the fifth Sunday after Pentecost in the Byzantine lectionary-cycle. But that small assortment of manuscripts includes Codex Sinaiticus (from the mid-300s) and several other uncials. ● Mark 14:3. Codex D (05, Codex Bezae) inserts Jesus’ name. Codex Bezae’s text includes so many little expansions that one might argue that it is a mere coincidence that this one occurs at the beginning of the lection for the seventeenth Friday after Easter. ● Luke 7:1. Codex D basically rewrites the verse, which happens to begin the lection for the fifth Saturday after Pentecost. ● Luke 4:16. Codex D (and F and G and 579) insert Jesus’ name in the first part the verse; this happens to be the beginning of the lection for first Thursday after Pentecost. ● Luke 5:17. Codex D rewrites the verse, which happens to begin the lection for the second Saturday after Pentecost. ● Luke 16:19. Codex D reads “And He spoke another parable,” which could be an arbitrarily made harmonization, but which interlocks snugly with Burgon’s idea that the purpose for the harmonization at this particular point was to serve as a lection-incipit, that is, one of the brief phrases with which lectors introduced the daily reading. ● John 14:1. Codex D begins the verse with “And He said to His disciples,” which looks very much like an lection-incipit, that is, one of the brief phrases with which lectors introduced the daily reading. As it turns out, a lection does indeed begin at this exact point; in the Byzantine lectionary John 14:1-10 is the lection for the sixth Friday after Easter. Burgon also proposed, in the same book, an interesting theory about Codex Bezae’s unusual reading in Mark 14:41, το τέλος και (between ἀπέχει and ηωρα): “Nothing else has happened here,” Burgon proposed, “but that a marginal note, designed originally to indicate the end (το τέλος) of the lesson for the third day of the second week of the Carnival, has lost its way from the end of verse 42, and got thrust into the text of verse 41.” Burgon noted that this reading is supported by the Peshitta, by the Old Latin, and by the Philoxenian version – which would mean that this quarter of witnesses echoes a yet-earlier ancestor; Burgon proposed that such an ancestral text came from the 100s. 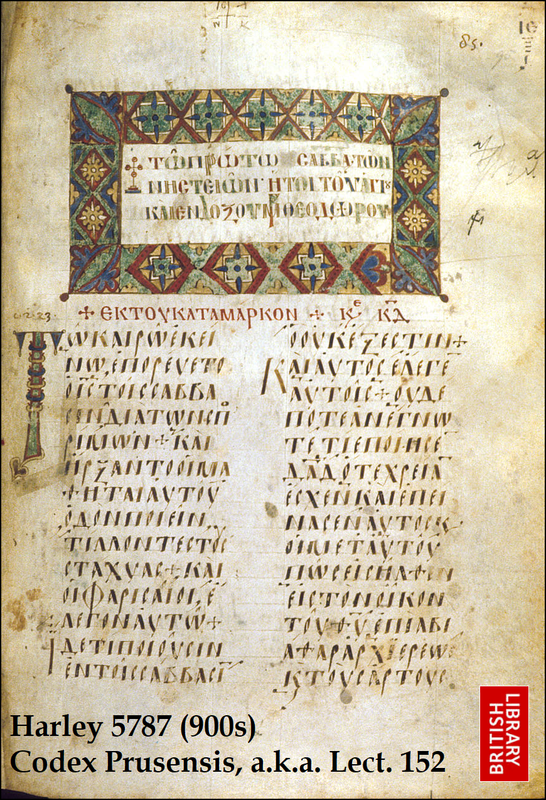 Willker’s Textual Commentary on the Greek Gospels confirms that το τέλος Or its non-Greek counterparts) is in the text of Mark 14:41 not only in Codex D but also in Codex W (ἀπέχει το τέλος ἰδου ηλθεν) and Codex Θ (ἀπέχητο· το τέλος ηλθεν), as well as 0233, family 13 (a small cluster of MSS that share an earlier ancestor-copy), 565, 713, 1071, lectionary 844, and the Armenian version and one Georgian copy, and that it is not only supported by the Peshitta but also by the Siniatic Syriac and the Harklean Syriac – plus several Old Latin manuscripts including Codex Vercellensis (which probably was produced in the 370s). Willker also observes that in the margin of Codex Vaticanus at this point there is a distigme (that is, a symbo resembling an umlaut which conveys that the person who added it was aware of a textual variant in the line of text that it accompanies – though there is some debate about the date at which this person worked) and that not only Burgon, but also Scrivener advocated the theory that το τέλος had first entered the margin to signal the end of a lection before being blended into the text of Mark 14:41, and that later copyists and translators tackled it in their own ways. A consultation of a footnote on page 76 of the first volume of the 1894 edition of Scrivener’s Plain Introduction confirms that Scrivener regarded Codex D’s readings in Luke 16:19 and John 14:1 as lection-incipits, and he also says that the το τέλος in Mark 14:41 “probably has the same origin.” Yet Burgon, in chapter 12 of Causes of Corruption (written some time after his defense of Mark 16:9-20), explained the presence of το τέλος as a slight expansion, rather than as an insertion of stray marginalia, stating in a footnote that he retracted unreservedly what he had proposed in The Last Twelve Verses of Mark regarding this variant. Hort, in his 1881 Notes on Select Readings, proposed that το τέλος was added not as a lost lection-ending note, but as an attempted harmonization drawn from Luke 22:37, where Jesus – still in the upper room – states that the prophecies about Him are being fulfilled, that is, reaching their end (καὶ γαρ το περι εμου τελος εχει). This seems unlikely, inasmuch as a harmonizer would have no motive to be so frugal. Metzger resorted to the guess that a copyist was puzzled by the somewhat rare ἀπέχει (or thought that the readers of their manuscripts would be puzzled) and added το τέλος to add clarity – but it seems to me that this would be far down any clarity-prioritizing copyist’s list of options. The presence of such phenomena in Codex Bezae and in the Old Latin copies is especially interesting because these particular witnesses tend to echo the Western text that circulated widely in the latter half of the 100s. The case that the variants in the list just given show the influence of early lection-cycles might not be irresistible, but it is strong, and the inference from this is that the influence of basic lection-cycles involving the main annual Christian feasts should not be casually dismissed as a possible cause of textual variants that emerged as early as the 100s, when the bishop of Rome, until cooler heads prevailed, was willing to excommunicate fellow Christians because they would not celebrate Easter at the same time he did. This factor – the influence of lection-cycles – should be considered not only when evaluating the variant-units mentioned earlier, but also some other variant-units, including Luke 22:43-44 and John 7:53-8:11. Mr. Snapp, I apologize for going off topic a little, but what do you think is the best translation of the Greek word "monogenes"- as "only begotten" or "unique"? This is very important matter that seems to cause great confusion for some Christians. I think "only begotten" is the best way to render the term into English. http://www.bible-researcher.com/only-begotten.html (and please be sure to read the footnotes there). Thank you for the helpful reference. God bless. Never heard of the notion that the number of "318" bishops attending Nicea was significant because "318" in Greek numerals is "TIH", but the Orthodox Church does make a big deal of the fact that Abraham was accompanied by 318 servants in Gn 14.14— "And when Abram heard that his kinsman Lot had been taken captive, he counted his own servants, three hundred eighteen, and chased after them as far as Dan." This is why that reading is taken at vespers on the eve of the feast of the "318 Father of the First Ecumenical Council" and a couple of related occasions. το τέλος in Mark 14:41 looks to be a feature of the Caesarean Text: It's in Theta, F13, and 565. I wonder if anyone has checked the Armenian and Georgian mss which are known to omit the pericope.